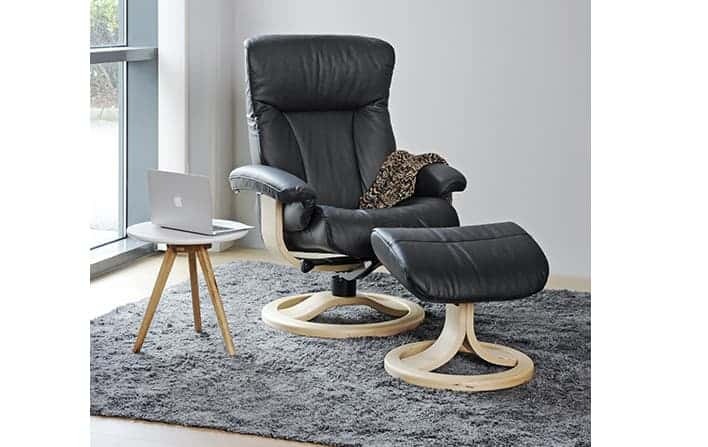 All Hjellegjerde of Norway Euro Style Recliners with ottomans come with a factory warranty of ten years on steel frame and mechanism , five years on the cushions and wood, and two years on the leather covering. All Swing Relaxer recliners come with a factory warranty of three years on the mechanisms, five years on the cushions and frame and two years on the leather covering. Leather furniture requires regular care and maintenance. At Chair Land, Inc. we recommend Guardian leather care products. Guardian leather cleaner should be used on a regular basis to remove body oils and dirt from the leather. Guardian leather conditioner should be applied on a seasonal basis to provide a barrier against dirt and body oils. Using these products as directed will help keep your leather looking beautiful for many years. Wood portions should be dusted on a regular basis and a high-quality wood furniture polish should be applied using a white dust cloth.